The issue of political correctness is hotly debated. Following the debate Trump went on a Twitter rampage against Kelly including the insinuation that her tough questions toward him may have been because she was menstruating. When pressed about these comments, Trump once again attacked the “politically correct” crowd. In part, Trump is right. We do have a problem with political correctness. It is limiting conversation, silencing truth, and inhibiting the political process. America is built on the idea of free debate and an open exchange of ideas. However, when the mayor of Chicago discriminates against a company because its owners believe in New Testament marriage, political correctness has gone mad. When men and women do not feel free to express their ideas, being politically correct has become an idol instead of a servant. The desire to be politically correct should never keep someone from saying what they believe to be true. It should never hinder healthy debate. It should never cause us to outcast a person because of an idea. 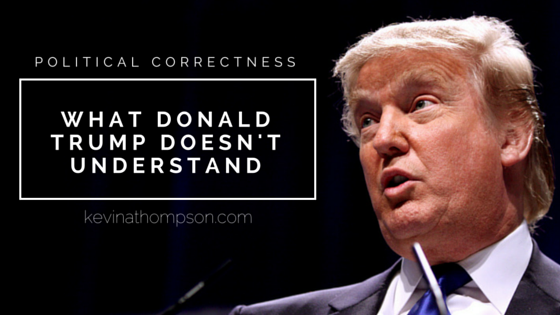 Yet, what Trump fails to realize is the criticism he is receiving has nothing to do with political correctness. He is being criticized because he is wrong. He said sexist things. His disagreement with Megyn Kelly is fine, but the method of his attack is inexcusable. When political correctness silences truth, it has gone too far. When political correctness causes us to check our language so we are not unnecessarily hurtful, it is a great gift. Some expect perfection with words and become the Politically Correct Police. Any word which could be considered offensive is out of bounds. Any past example of speech, now deemed inappropriate, disqualifies the person for any recognition, position, or success. Others believe any discussion regarding language is a sign of political correctness gone mad. They rebuke the idea that some words are wrong and should no longer be used. They will intentionally use words and symbols (sexist terms, the Confederate flag, etc.) to make their point. They unashamedly hurt others to express their rights. We miss the truth with political correctness whenever we believe either extreme view–it’s all right or it’s all wrong. We understand it properly whenever we discern our ability to choose better words while also telling the truth. However, if we can choose a better word or phrase without changing the message, we must do so. We must understand, while our intent is the most important thing, our words also matter. If we can make the same point with a different word, why not choose a different word? In light of this discussion, we must do two things. We must be extremely gracious with others. Because we all say stupid things on a daily basis, it should give us a deep compassion toward others when they say something they shouldn’t. While we should help them with their speech, we should not judge them because of it. No words are perfect. We shouldn’t expect others to speak perfectly and we shouldn’t expect it from ourselves. Speaking perfectly is not possible. But we can improve. We can learn from others and choose better words. As we do, we must also demonstrate the courage to speak the truth even if others are offended by it. If I remember correctly Jesus came full of grace and truth. Hope to always grow more gentle in my words and tone. Your analysis and advice are spot on. Too many people are eager to use colorful words and phrases with the intent of inciting and offending others. In the end, their core message goes unheard because of the unnecessary “chatter” they create.